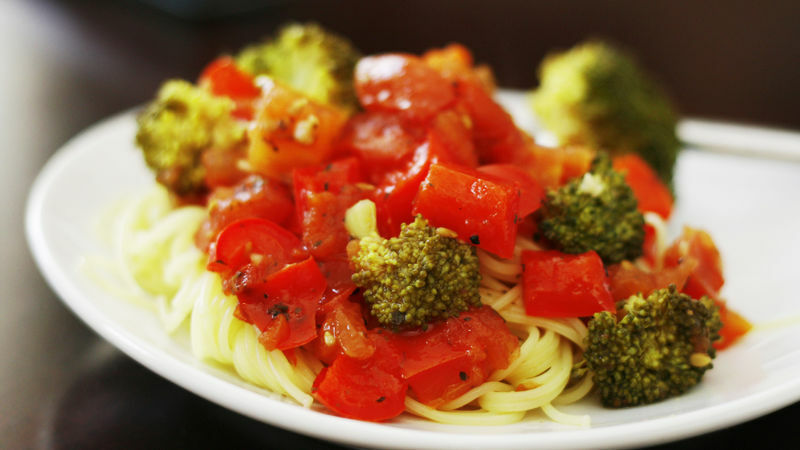 In a 9x13 baking dish with sides, combine the tomatoes, red pepper and broccoli. Drizzle with olive oil and sprinkle with sea salt, pepper, basil and garlic. Mix well, then spread out into a single layer. Bake the sauce for 25-30 minutes until the vegetables are tender. Looking for a smooth pasta sauce? This isn’t it. But this Roasted Vegetable Sauce for Pasta is a fresh, bright, flavorful and chunky sauce that will leave you clamoring for more. The recipe is really no-nonsense. You dice the ingredients, toss them in a baking pan and bake for about 30 minutes. No stirring, fussing or watching necessary. And if you make the pasta while the sauce is cooking, your dinner is on the table even faster. Serve this with a big salad and bread, if you want … or just have the pasta and call it a night. Either way, it’s a tasty dinner that won’t stress you out one bit. Looking for a smooth pasta sauce? This isn’t it. But this Roasted Vegetable Sauce for Pasta is a fresh, bright, flavorful and chunky sauce that will leave you clamoring for more. The recipe is really no-nonsense. You dice the ingredients, toss them in a baking pan and bake for about 30 minutes. No stirring, fussing or watching necessary. And if you make the pasta while the sauce is cooking, your dinner is on the table even faster. Serve this with a big salad and bread, if you want … or just have the pasta and call it a night. Either way, it’s a tasty dinner that won’t stress you out one bit.